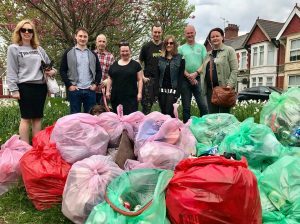 The weekend of the 21st/22nd April was a busy one, as around the city volunteers came from all over Cardiff to take part in seven different litter picks, as well as making time to fit in a ‘Keep Tidy’ Network meeting. Saturday kicked off with the newly constituted ‘Pontprennau Clean and Green’ tackling the Pontprennau Waitrose, collecting an outstanding 60 bags of litter in just two hours. Keep Roath Tidy and Keep Grangetown Tidy were also out and about in Albany Road and Merches Garden respectively. Meanwhile over in Adamsdown the Love Where You Live team and Keep Wales Tidy, joined by members of Keep Splott Tidy and the Whitchurch Waste Warriors, teamed up with Keep Adamsdown Tidy on their litter pick – hitting Helen Park, before heading off to the 3rd ‘Keep Tidy’ Network which took place in the Royal Oak pub off Broadway. The network meeting saw representatives from 7 different groups come together to share with each other what they had been up to, and discuss ideas and issues. Cleansing and enforcement officers were also on hand to answer any questions. 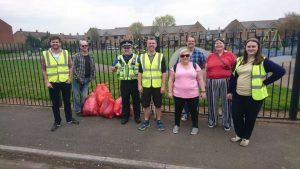 The group discussed the process behind enforcement action, Keep Splott Tidy’s June 24th Beach Clean, as well as hearing the ambitious plans of our newest group – Keep Riverside Tidy – which included having ‘Tidy Businesses’, ‘Street Ambassadors’ and local community gardens. 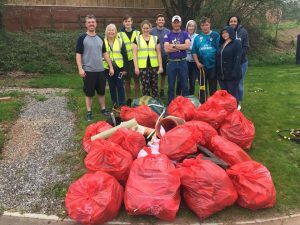 On Sunday the volunteering didn’t stop with litter picks in Penylan and St. Ederyns helped out by Keep Wales Tidy, and an epic Rhymney River bank clean up led by the Cardiff Rivers Group. A great way to celebrate Earth Day! 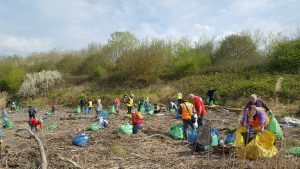 The riverbank clean-up was a great success with 55 volunteers spending 2 hours collecting 1.5 tonnes of waste, plus 30 bags of marine plastic. And to make the pick more interesting volunteers had to sit down and hand pick thousands of pieces of polystyrene that littered the entire area. 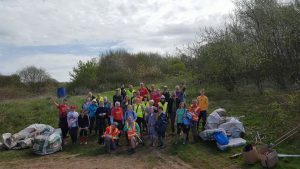 Luckily, the weather held out and it was a great day enjoyed by all, and made a real difference to the local environment. In all over the weekend around 200 volunteers, supported by Cardiff Council and Keep Wales Tidy, collected nearly 300 bags of litter, plus an additional 2 tonne of other waste. All the plastics will be sent off to our partners Terracycle to be recycled into shampoo bottles. If you would like to get involved there are always events going on throughout Cardiff, both at weekends and during the week – so check out our website www.keepcardifftidy.com/volunteer#events or get in touch at mailto:lovewhereyoulive@cardiff.gov.ukor call 029 2071 7717 to speak to one of the team.